We’re On A Mission – for Better, Greener Buildings that will Tackle the Challenge of Climate Change! From existing buildings to new construction, we know that buildings play a crucial role in meeting the urgent challenge of climate change. According to the Energy Information Administration, buildings in the United States are responsible for over 40% of national greenhouse gas emissions. The City of St. Louis’s 2015 greenhouse gas inventory revealed that local impacts are much higher; residential and commercial buildings are responsible for over 60% of greenhouse gas emissions. The critical time for climate action is now, and now more than ever, it’s critical that we change the way we build and operate our buildings. 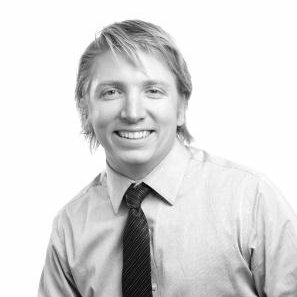 We must focus on wellness for building occupants and the planet, addressing existing and new buildings, inside and out. It was with this imperative in mind that the USGBC-Missouri Gateway Chapter’s Board of Directors drafted our 2018-2020 Strategic Directions. We plan to build on our 2017 momentum and move forward with three focus areas: foster green building leaders of the future, lead green building professional education, and advance green building through advocacy and community outreach. I want to share some of our 2017 accomplishments today, and invite you to join us in the work ahead. We continue to push for Better Buildings with Benchmarking. You know the saying, “you can’t manage what you don’t measure!” Energy and water benchmarking is the first step toward improved performance, cost savings, and reduced environmental impacts. 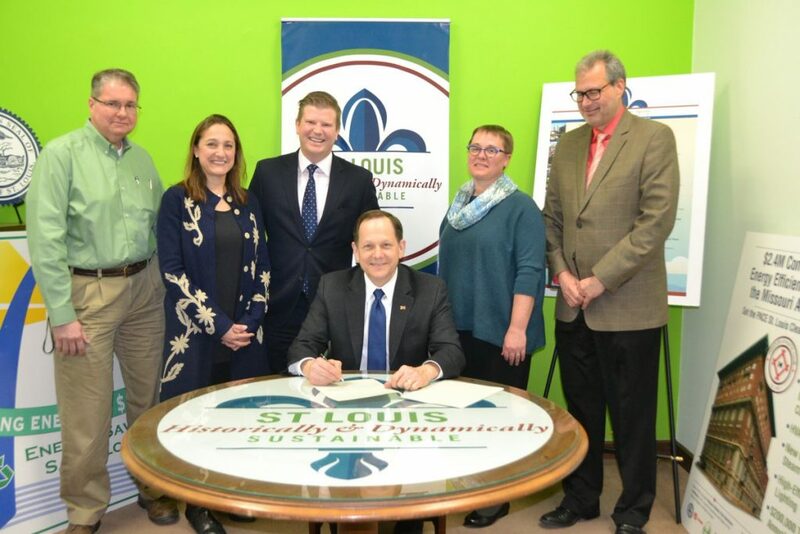 We significantly expanded our benchmarking work this year by helping the City of St. Louis with the passage and implementation of their Building Energy Awareness Ordinance. This work received recognition just last week with an Outstanding Local Government Achievement Award from East-West Gateway Council of Governments in the public-non-profit partnership category. We were thrilled to assist Bethel Lutheran Church become the First House of Worship to earn ENERGY STAR Certification in Missouri! With an ENERGY STAR score of 81, Bethel Lutheran outperforms 81 percent of worship facilities nationwide. Their energy achievements are due to many years of dedicated work by the church’s Green Team. Our Advocacy Committee volunteers verified Bethel Lutheran’s ENERGY STAR application, confirming that energy and building data was correct and that the building meets EPA’s Indoor Environmental Quality and Thermal Comfort standards. Once again we were blown away by the creativity and passion of students participating in our Green Schools Quest. Our Green Schools Quest paired 47 school-mentor teams for the 2016-2017 school year. 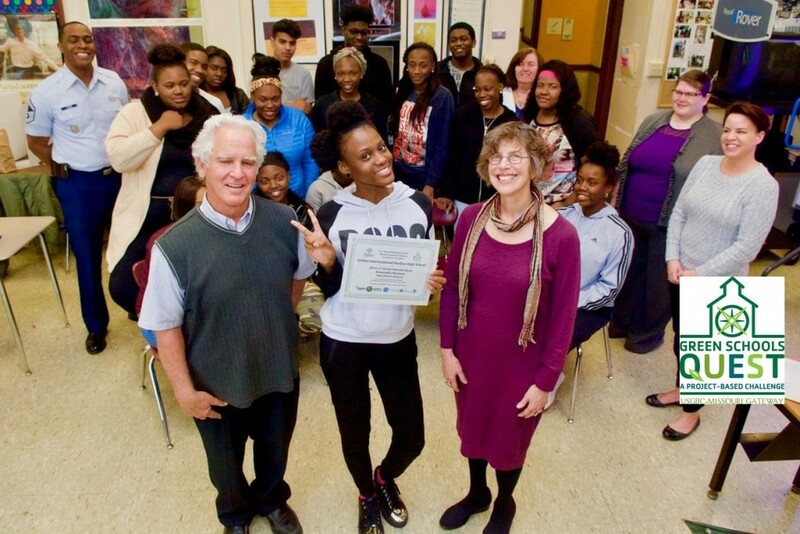 Over 5,500 students and staff participated in sustainability projects, reaching an additional 20,000 community members. Projects ranged from energy audits & window weatherization to waste audits, material reuse & cafeteria composting! Participation in the 2017-18 school year is our highest levels yet; 57 school and mentor teams are participating in the fifth year of the Green Schools Quest! And we continue to provide excellent educational opportunities. From inspirational to in-depth, we covered a lot of topics this year – materials transparency, sustainability in construction administration, landscape performance, project delivery mapping, historic preservation & sustainability, lighting controls and much more! We are on a mission – a mission to make every building a green building – and we cannot get there without your help. For over 15 years, we have been part of your community; advocating and educating for better, greener buildings. Support this important work by making a donation today! 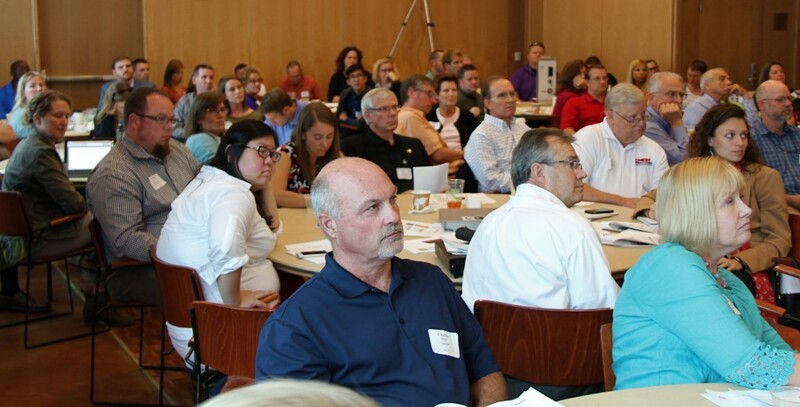 USGBC-Missouri Gateway Chapter is seeking the services of multiple Energy Auditors, each to provide one pro bono building energy audit for congregations and faith communities within our Chapter territory. 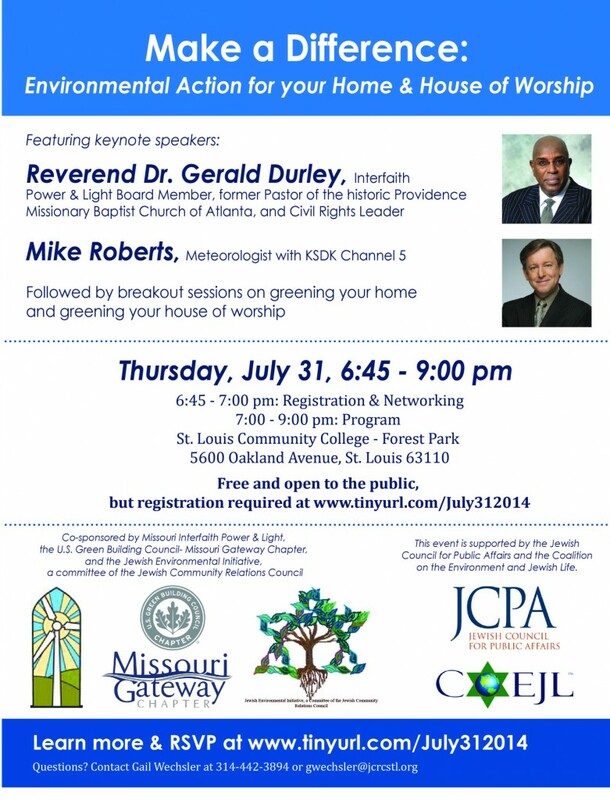 We are pleased to once again partner with Missouri Interfaith Power & Light to provide complimentary energy audits for a limited number of local congregations and faith-communities. 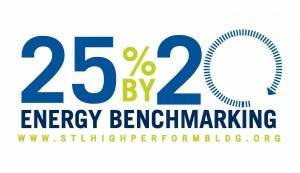 This is part of the 25 x 20 Voluntary Energy Benchmarking Campaign – www.25×20.org. Learn more about audits provided in 2014-2015 here and here. View the full Request for Qualifications. An indication of interest and qualifications are due electronically USGBC-Missouri Gateway by midnight on Friday, January 8, 2016. Once we determine how many audits can be offered, we will issue a call for congregations to apply, with a goal of matching auditors with congregations by the end of February 2016. USGBC-Missouri Gateway Chapter seeks the services of an Energy Auditor to perform a limited number of building energy audits for congregations and faith communities within our Chapter territory. 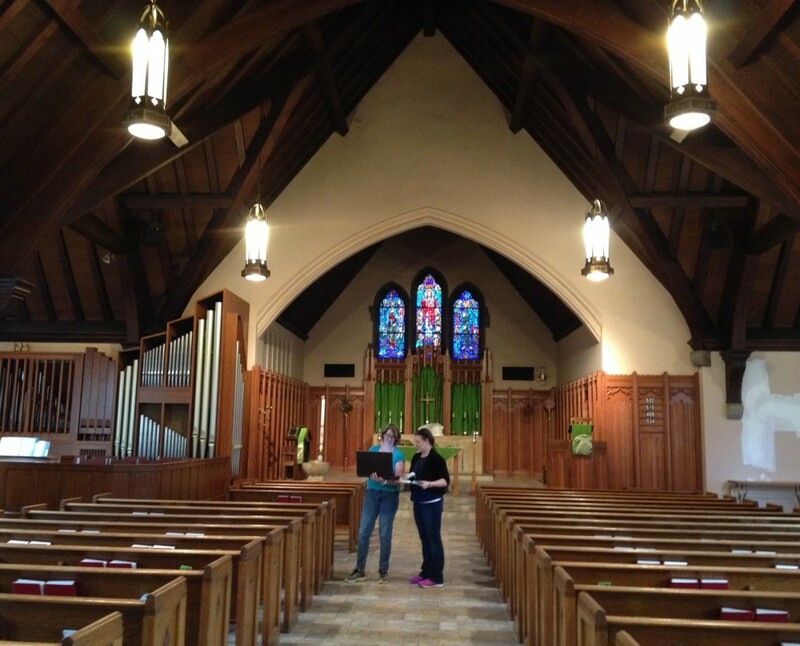 We are pleased to be partnering with Missouri Interfaith Power & Light to provide energy audits for a limited number of local congregations and faith-communities. This is part of the 25 x 20 Voluntary Energy Benchmarking Campaign – www.25×20.org. Audits are courtesy of a grant from the national USGBC. View the full Request for Proposals. Check out our 2013 Annual Report! Every year we make progress towards the goal of ensuring that green building is accessible to all through our outreach, education, collaborations and partnerships. In 2013, we took several big leaps that support our mission of making every building a green building. Through these big leaps,, we have grown and green building has grown! We are pleased to share our 2013 Annual Report with you! Thanks to our leadership, committees, volunteers, members, sponsors and donors for making 2013 a success! 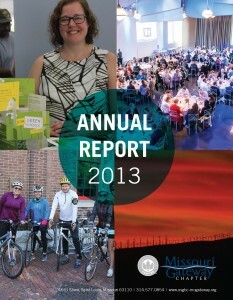 You can view or download the entire 2013 Annual Report here. You’ve heard of Black Friday and Cyber Monday. Well there’s a new day in the Holiday Season- a day to give back. December 3rd is now Giving Tuesday, a day dedicated to giving. In November we’ll be posting regularly on our Facebook, Twitter, and LinkedIn pages about our work to provide everyone with access to green buildings and green communities. We are much more than a member group or a professional organization; along with providing valuable education and networking opportunities, we provide a wide range of community projects that we call Community Build. Our Community Build projects support local governments, emerging professionals, local community organizations and the public to move along the path towards sustainability. 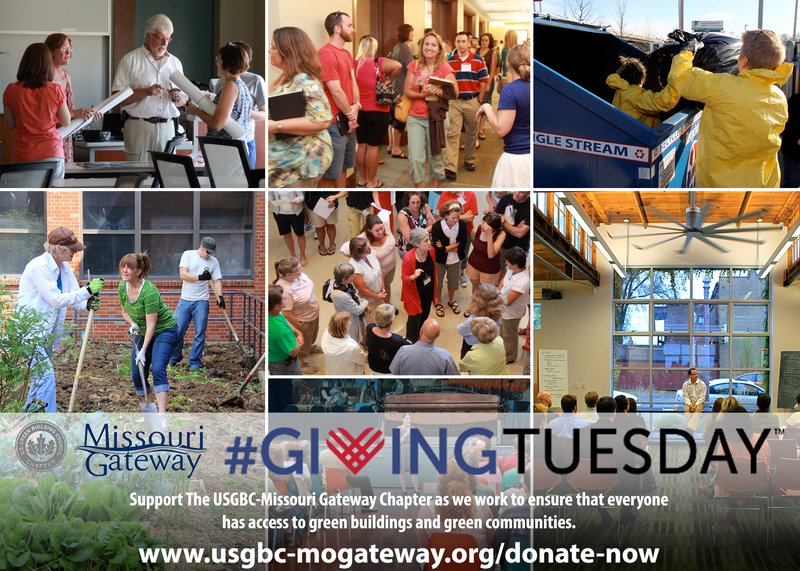 So stay tuned on social media to hear more about the specific impact of each of these projects and support our work to make green buildings and green communities accessible to all by making a donation on Giving Tuesday.